A healthy community begins at the individual level. Maslow’s hierarchy of needs demonstrates that an individual’s basic needs (food, water and shelter) have to be met before they can have independence. When individuals are healthy and met their basic needs, they can realize their personal potential and the potentials of others. Certain groups, like women, children and the elderly, can be more vulnerable and there is a greater focus on meeting their basic needs. Government programs, like the Special Supplemental Nutrition Program for Women, Infants and Children (WIC), provides health care resources for low-income moms and young children. This offers many in vulnerable positions a level of assistance to meet their basic needs. Once these needs are satisfied, they can turn their attention to their families, neighbors, friends and colleagues. It is important for government leaders to know the vulnerable populations in their community and know what they need. By helping these individuals meet their goals, public administrators are essentially creating a more healthy society. 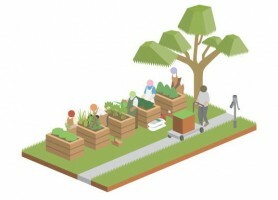 Community gardens are one way of promoting healthy eating and bringing a sense of unity to families and neighborhoods. Individuals of all ages can come together to plant seeds, learn where their food comes from and how to use the food they grow to create healthy meals. Gardens are especially good for engaging children in healthy eating. In August 2014, the American Heart Association reported that childhood obesity is the number one health concern among parents in the United States. About one in three children and teens is overweight. Providing opportunities and making it easier for the younger populations to learn about good eating habits builds healthy adults and helps them be more focused and successful in school. Feeding America, the largest domestic hunger-relief charity in the U.S., understands the magnitude of hunger and food insecurity in our country. It serves roughly 12 million children and 7 million senior citizens each year. They have also discovered that about 89 percent of households with children are food insecure. By bringing people together to start a community garden, public leaders can help create a culture that focuses on the importance, and fun, of living a healthy lifestyle. San Francisco recently implemented a tax incentive for urban agriculture, allowing property owners in the city to receive a property tax reduction when contracting out their land for agricultural use for at least five years. This policy will hopefully encourage residents to grow and consume healthier, local foods. Besides promoting healthy living policies, governments also have the potential to lead positive health and safety changes through development and infrastructure. Community leaders can increase bike lanes to promote exercise and an active commute, as well as access to safe and clean parks for citizens of all ages. The University of Delaware Institute for Public Administration has created a healthy communities assessment tool as a resource for local governments. The tool provides examples of best practices and strategies for developing goals, policies and infrastructure that can provide residents with opportunities to live healthier lives. It is important to create healthy communities, not only for the overall well-being of the population, but for the long term condition and growth of the community. One of the four pillars of the city resilience framework from the 100 Resilient Cities challenge, pioneered by the Rockefeller Foundation, is health and well-being. This crucial aspect of a resilient city is defined as people having access to basic resources they need for survival (especially in times of crisis), access to diverse livelihoods and employment, and access to public health services. Healthy communities are more resilient. The better the city leaders know the people, including vulnerable populations and social conditions in the community, the better they can serve and lead the public during a crisis and adapt to the change. Governments should be thinking more about protecting their vulnerable populations to ensure their long-term health and safety. This will ultimately have positive impacts on the rest of the community.